I was hoping to end the year with a bang when it came to our free plugins and themes of the month posts for December, and the selection available to me certainly didn’t disappoint. This month I had more shortlisted themes to choose from than I ever have, which means that what you see below is arguably one of the best offerings yet. One thing is for sure — it was not easy whittling down the huge list of themes I had down to just five. To keep things interesting I picked five very different themes. Enjoy! We’ll start with something really simple. I love minimalistic blog design with a focus on content — I’d rather be reading a sparse blog than an overpopulated one every time. With that in mind we have Publish. It’s essentially a blank canvas — whilst you could use it as is, you could also use it as a base on which to build. It is fully responsive and has support for all of the basic WordPress features you would expect (such as custom menus and post formats). 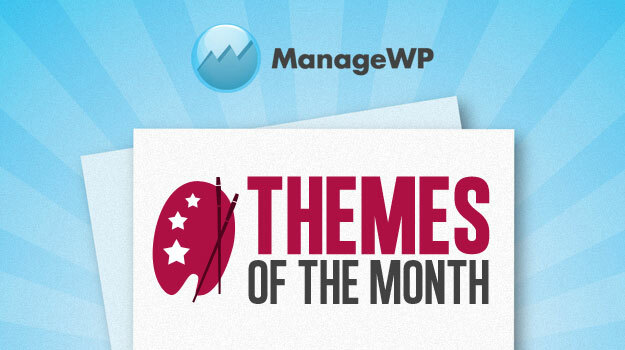 We usually include a business theme in our themes of the month post and December’s edition is no exception. Poloray is a rather attractive effort with the usual slider up top / summary widgets below setup. 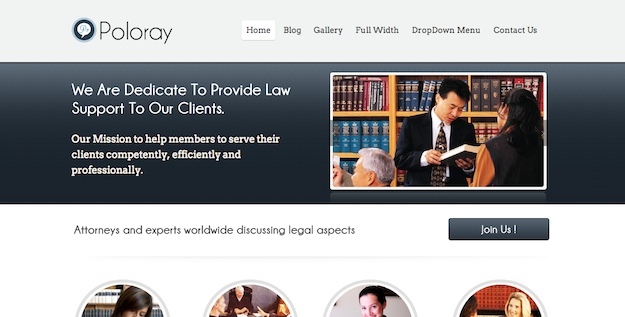 If you’re looking for a simple theme on which you can build your business’ first website, Poloray is a great option. Perhaps the most unique theme in this month’s edition, PinBlue is clearly inspired by Pinterest, but that is no bad thing. If your blog is image-driven (or even if not), PinBlue is a really interesting option to set your design apart from all the other blogs out there. At its heart Infoist is a rather basic blogging theme, but its attractive use of color and space sets it apart from typical blog designs. It is perhaps more akin to a Tumblr theme than WordPress. There’s not much more to say about Infoist — if you are a personal blogger then it is definitely worth considering. I am a huge fan of Caroline Moore’s work — she never disappoints. We’ve featured her themes before here on the ManageWP blog and will continue to do so as long as she keeps creating them. Something Fishy has to be seen to be believed. Whilst it looks like a relatively normal (albeit well designed) theme in the screenshot above, you have to view the demo to see what makes it so special and unique. I won’t spoil the surprise — go and check it out for yourself! Looks nice theme, I am using the last one in the list infoist in one of my blogs and now I will wait for the next list of themes u post in future. By the way when u will post the next list of free themes. 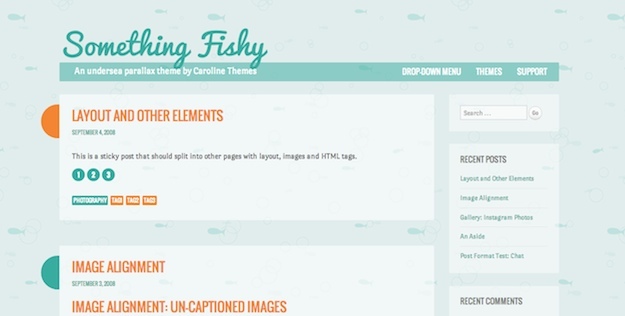 These are really nice themes for wordpress. I use this themes http://superthemes.org/ for my portfolio, realy amazing themes , i can change all easy. 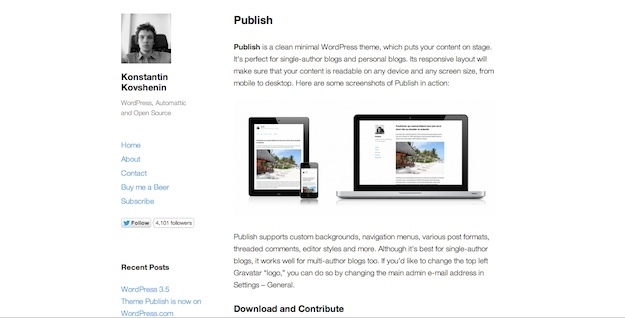 Pinblue wordpress theme looks awesome.thanks for sharing. The first one is really great, i must use it in my next blog. Thanks a ton.. These free WordPress themes look great, but the last 2 ones are a little bit lower quality the the previous 3 🙁 I hope we could get some free themes which are both great in design and efficient in using. Nice collection theme 2012.Thanks for a grate post. Hi, i created this free WordPress theme. Nice theme Alex. Good work! I will try to improve the responsive version.